A total of 57.7% of all downstream internet traffic is video, with Netflix the number one source of this traffic globally, according to new research. 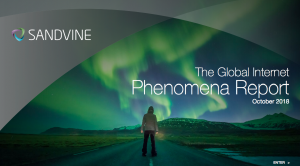 Sandvine’s H1 2018 Global Internet Phenomena Report said that Netflix accounts for 15.0% of downstream traffic across the entire internet, and for 26.6% of video streaming traffic globally. YouTube came in third place with a 21.3% share of global video streaming traffic, behind HTTP media streams at 24.4% – which represents the growth in streaming services that Sandvine has not yet tracked individually. Similarly, Raw MPEG-TG, a video protocol that is commonly used by operators to stream video from broadcast channels, came fourth with an 8.0% share of video streaming traffic, followed by Amazon Prime (5.7%), Twitch (3.5%) and Facebook Video (3.4%). Pirate site Openload came eighth on the video front with 0.8% of global video traffic, ahead of Sky go at 0.5% and Hulu at 0.4%. On a regional basis, Netflix was the most popular video online service in the Americas, and was number two in Europe, the Middle East and Africa behind YouTube. In Asia Pacific, HTTP media streams were most popular, followed by Facebook in second place and Netflix in third. Sandvine is a provider of network intelligence solutions and its Global Internet Phenomena Report looks at how applications are consuming the world’s internet bandwidth.